Revenge tastes sweet. And it is best served cold. This is the type of revenge in its purest and most crystalline form. It is also, perhaps paradoxically, the most exciting kind of revenge as it combines a lingering sense of anger and betrayal with the time and patience necessary to return the “favor.” Think of it as an amplified grudge underscored by malicious will directed towards the source who did us wrong. It is the law of karma but a karma that lies within our own grasp and control; we take it upon ourselves, hence we take the law into our own hands so we can decide the specific time, amount and dose of our planned action. It is as premeditated as it goes, a calculation of hitting where it hurts most, often emulating the pain and suffering on an even higher scale, sometimes even tenfold, with the stakes raised significantly. There are also other types of revenge, namely those that happen in the heat of the moment. This “hot-blooded” revenge is often referred to as a crime of passion. The element of justice makes its deliberate and intentional violence strangely enough a morally acceptable deed since it is a returned “favour” underscoring the laws of cause and effect of "what goes up must come down.” In a crime of passion, we may forgive the culprit because he might have caught his cheating partner in flagranti and in media res of the sexual act. So in a temporary lapse of reason, he shoots them both. I am using the male pronoun because it is quite often combined with a supposedly male sense, and some may call it “duty,” of honor to punish both the wife and the intrusive lover for their wicked ways. Keep in mind that sexual infidelity is an evolutionary charged nightmare, especially for the male species. This situation is generally associated with shame, dignity and wounded pride not only towards the person but also one's family, anyone who carries one's name. This is upheld by the belief that such a normally morally reprehensible action, the intentional killing of living beings may in this case right the wrongs and the line between victim and culprit may become distinctively blurred. The claimant in our imagined crime of passion will say he lost his head; especially as a male, again evolutionary speaking, how could he possibly keep his cool under the circumstances, catching his wife red-handed and -faced screwing another man behind his back. So we forgive him and wish him better luck next time around when it comes to women and personal relationships. But isn't the aforementioned calculated form of revenge, the dish served cold, not equal to premeditated murder in comparison? Of course, the avenger has been wronged previously, and we judge the act of vengeance in proportion to the previous harm done, yet the time it takes to carry out the act of vengeance and then to do so in a cold-blooded and conscious manner makes this type of crime less pardonable in my eyes. Do we all subscribe to the maxim of “tooth for a tooth” and “eye for an eye”? If all society lived that way, imagine all the cases of dental work and reconstructive surgery. As Gandhi once said, an eye for an eye makes the whole world go blind. So how come we turn a blind eye to revenge and even root for the avenger? 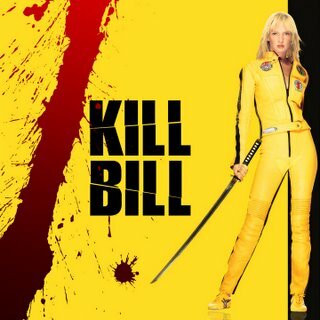 And then there was the Bride Beatrix Kiddo, a determined and highly skilled woman who is on the demonic prowl for revenge to eventually kill Bill, her source of once and continuous suffering. She has made her own personal hit list that builds up towards the head of the gang while leaving, of course, the most important and most guilty person for last on this bloody trail of hers: Bill, the man who pulled the trigger on her. Our sympathy lies with the Bride because cruel Bill had sent his Viper Squad to slaughter this pregnant (!) woman on her wedding rehearsal day! Eventually, he shoots this defenseless and bloody body in front of him after she confesses that she is pregnant with his child! Yet she awakes from her coma childless (at that time neither she nor we know that the baby is alive and in the care of psychopathic Bill). Yet it enrages us because Bill acted as a coward sending his most astute killing machines to attack a pregnant woman: On the scale of one to ten, this gets a full and rousing ten! No wonder she made a hit list to get even (and she threw in perverse and odious Buck for good measure) and with each killing she gets closer to the ultimate show-down, Bill himself. As we are following this angry woman, we are given some back story, predominantly in the second volume, and suddenly we see that the whole issue was not as simple or black and white as it seemed at first. Despite ourselves, we tend to “like” Bill because of his charisma and charm, and we understand how she could have fallen for him. We also, in a rather twisted sort of way, understand why he wanted to kill her; she had left him and preferred to start a new life without him and with someone else (remember the previous scenario of the hurt and vengeful hot-blooded macho). When Bill caught wind of her whereabouts and her sudden intention of getting married to this ordinary Joe, in his view a nobody and an commonplace fool, Bill sees red and commits this brutal crime of passion. He insists on the fact that it is not a sadistic, but rather a masochistic act as he is supposedly hurting himself in the whole process. In fact, Bill has been more than a lover, he has also been a father figure to her. He has taught her how to fight; Pygmalion-like, he has shaped her into the skilled and tough killer that she is. When she discovers that she is pregnant with his child, she decides to quit the killing business and to leave him, the biological father of her child. Thus, in an act of revenge, the roles are later reversed and suddenly the victim, our beloved Bride becomes the avenger. And, in fact, she also turns the tables on him and kills him, hence not only doing as he does but actually becoming (like) him. Since we sympathize with the victim, we tend to overlook the fact that the victim not only commits cruelties like her opponent, but indeed surpasses him. On a symbolic and Freudian level, the act of killing her personal trainer / lover / father figure / father of her child, she (re-)incorporates all those facets within herself, the same way warriors of the past would eat the bleeding heart of their enemies to gain and transfer their previous strength. However, the act of revenge turns into a difficult moral choice in the skilled hands of a director like Quentin Tarantino. The final killing comes not easy and Tarantino gives Bill an honorable and dignified exit with a death that is unusually anti-climactic considering the slow and steady build-up of the story. But there was also part of me that again was taken in by Bill and as a viewer I wished they could simply get along, call it quits, kiss, hug and forgive each other by letting bygones be bygones. That a psychopath like Bill could possibly be a good and caring father is shown not only through the fact that he had managed to take good care of his daughter over the years, but through the simple yet tender action of gently cutting off the crust of his young daughter's sandwich. Such minor seeming details show us how much he is capable of caring for his daughter on his “off-days,” when he is not involved in the killing business. Notwithstanding, since this is a tale of vengeance, he has to die; there is no way around it. His death and her subsequent freedom seal the deal. Revenge has been taken at last and all again is good and well with the world.